Samsung’s bold vision for connected living is to take the half a billion devices it sells every year and make them connected and intelligent. This was the opening statement of H. S. Kim, President and CEO, Samsung Electronics, at a press conference held at the recently concluded Consumer Electronics Show (CES) in Las Vegas. “We will change every aspect of how we live, how we work, how we play — with high speed, massive capacity and low latency,” Kim said. The Samsung CEO said that in 2019, the company will be launching more AI for consumers — new applications and new devices that will bring AI to the center of the connected life. Amid the flurry of announcements on new devices, 5G, and artificial intelligence (AI), the Korean electronics firm launched AI-powered robotics platforms — Samsung Bot Care, Samsung Bot Air, Samsung Bot Retail, and Samsung GEMS. “We are harnessing the best of Samsung hardware, software and AI to help address emerging societal challenges through technology. 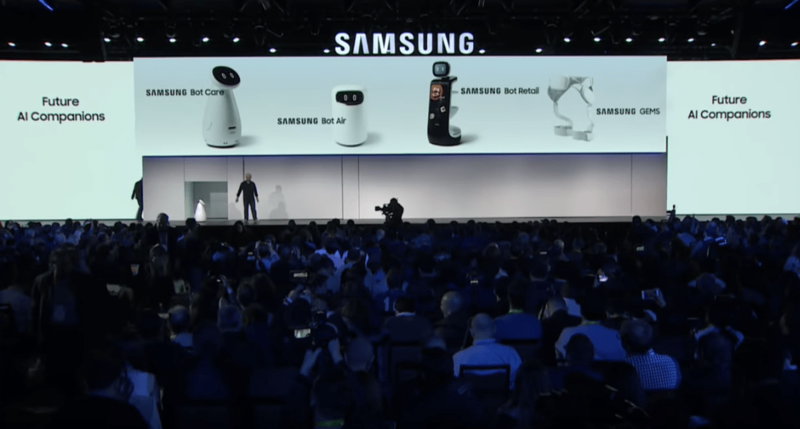 Here at CES, for the first time, we are introducing our robotics-based platforms that can be applied across a variety of areas,” said Yoon Lee, Senior Vice President, Samsung Electronics America. According to Lee, Samsung Bot Care helps consumers manage their daily health routines while Samsung Bot Air uses sensors to detect the precise source of pollution and purify the air. Samsung Bot Retail, on the other hand, personalizes the retail experience and streamlines ordering and paying. Samsung GEMS assists with walking, helps improves mobility and helps athletes train better. Gary Lee, Senior Vice President and Head of AI Center, Samsung Electronics, explained further that Samsung Bot Care has capabilities like checking vital signs like blood pressure and pulse and heart rate; as well as sharing exercise guidance and tracking medication intake. Both executives, howeveer, did not mention a timeline for the rollout of the new Samsung Bots.